Distinguished from neighboring buildings by the glistening silver and glass exterior and its sleek clean lines, the DC Marriott Marquis is an exquisite jewel of a hotel boasting more than 1100 rooms, plus the High Velocity restaurant and the wood lined Dignitary Lounge which has an encylopedic bar featuring more than 200 bourbons from around the world. 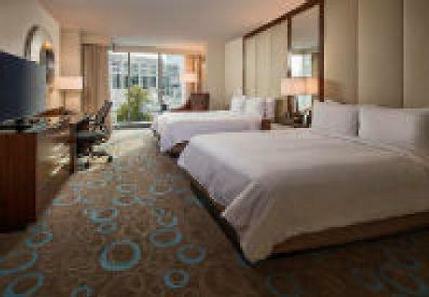 Located in the Mount Vernon area of Washington DC at 9th and Massachusetts, the Marriott Marquis DC is adjacent to the Convention Center, within walking distance of the Verizon Center, scores of restaurants and unique shopping venues. The lobby opens into an atrium that reaches skyward, overlooked by encircling balconies on each side, giving guests on each level a stunning view. Looking down into the lobby, one’s eyes become engaged with a gigantic metal sculpture which branches out with sinewy appendages that seem to want to touch the skies. While there is no swimming pool, the hotel has ample exercise equipment. The 12th floor concierge lounge (M Club) opens to an expansive balcony with a spectacular view of Washington DC looking toward the Washington Monument. Beakfastat the M Club is delightful, especially the bacon which is always crisp but never burned or soggy.